It was the disaster that shook the small mining village of Aberfan. On 21 October 1966, the village was devastated when a colliery waste tip collapsed, with slurry engulfing Pantglas Junior School on the last day before half term. A total of 144 people died, 116 of them children. Now the disaster is being recreated in Cwmaman as the latest series of TV drama The Crown explores the Queen's response to the tragedy. The hit Netflix series has reached 1966 in its timeline of Royal history. Eight days after the disaster, Queen Elizabeth II visited the village for the first time. 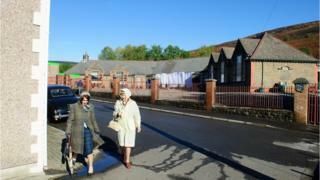 Pictures show cast members wearing 60s clothes and film crews working at a recreated Pantglas Junior School, where the disaster happened. Olivia Colman is playing Queen Elizabeth II in season three of the series. Jeff Edwards, who is one of the children who survived the Aberfan disaster, said the producers of The Crown contacted him earlier this year to tell him about their plans. He said he contacted community groups to arrange meetings with them to consider their views. "Following these meetings the production team decided to put on a public meeting which was held earlier this month and at which a dozen or so residents turned up and they outlined their proposals to them," he added. He said there would not be any filming in Aberfan. Colman, the star of Broadchurch and The Night Manager, takes over from Claire Foy - who portrays the Queen from her engagement to Prince Philip in 1947 to 1963. The Norwich born actress will be in series three and four, the first of which will air in 2019. Last year Colman said she was "so thrilled" to play the Queen, adding that her predecessor Foy would be an "incredibly hard act to follow". The producers of The Crown released a statement which said: "The third season of The Crown will cover the major historical events of Elizabeth II's reign from 1963-1977 and all strongly felt the Aberfan disaster and the events that followed must be included, especially as it continues to hold a deep resonance for the nation and the Queen herself. "As producers, we feel a responsibility to remain true to the memory and the experience of the survivors, so have met with community leaders, as well as the people of Aberfan on a number of occasions as part of our in depth research and to discuss our approach. "We have been made to feel welcome by the residents who have been very helpful in providing insight into one of the most tragic events of the 20th Century." BBC Wales has contacted Rhondda Cynon Taf council, Caerphilly council and Big Pit Museum for comment.